In the United States postmodern scepticism often has relegated Cy Twombly’s engagement with classical and humanist themes to nostalgia, irrelevance or an over-indulgence in European tropes. In the 1940s and 1950s, however, two of the most active polemicists of the period, Robert Motherwell and Charles Olson, the leader of the Black Mountain poets, saw Twombly’s early works as compatible with their own ideologies and artistic strategies. This paper argues that Twombly learned from his mentors and participated in an American revision of humanism that prepared a foundation for his lifelong commitment to humanist discourse. 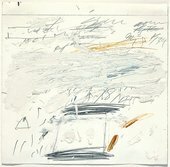 During the 1950s Cy Twombly’s life and career took what appears to be an epic path: from student at Black Mountain to artist with an international audience; from New York’s creative ferment to Rome, capital of la dolce vita; from the sphere of Robert Rauschenberg and Leo Castelli to a family life amidst the Italian aristocracy. At the end of that eventful period, during the New Year holiday of 1959–60, the artist created a painting, the subject and scale of which announced its milestone status. The Age of Alexander (fig.1) is Twombly’s first ‘history painting’, executed in a monumental format, measuring nearly 10 feet by 16 feet,1 and signalling passage and commemoration (‘1959 into 1960’ as the pencilled inscription bleeding off the right side informs us). On the face of it, it is a tour de force, recalling the campaigns of Alexander the Great in impastoed, oil-paint globules and smears, in pencilled and crayoned scratches and graffiti. More carefully read, however, the personal blends into the historical. This painting marks both a beginning – the arrival of Twombly’s infant son, Cyrus Alessandro – and the apex and finale of a decade-long endeavour to establish artistic credentials. It is a mature outpouring that confirms a unique style, forecasts lifelong themes and aesthetic directions, and suggests both personal and cultural content. However, The Age of Alexander also exhibits the antique references and humanist overlay that have occasioned both delight and derision among critics and viewers. In 1994 the painting was among those exhibited in the retrospective of Twombly’s works at the Museum of Modern Art. On this occasion, Artforum commissioned a pair of articles. I shall argue that Twombly’s oeuvre is distinguished – to the point of looking out of step with American production as early as the 1960s – by a nuanced, continuously-revised commitment to this discourse of humanism that was central to American left-leaning ideologies at mid-century. In this light, The Age of Alexander becomes a loaded consideration of one of the period’s most pressing issues: the construction of the human agent in the flow of history. What I am trying to establish is – that Modern Art isn’t dislocated, but something with roots, tradition and continuity. True to his words, Twombly produced paintings and sculpture that conjured the past. MIN-OE, 1951 (fig.2), is one of a group painted at Black Mountain, inspired by the anthropomorphic, often doubled, forms of Luristan bronzes. Tiznit (fig.3) and Quarzazat (fig.4), both of 1953, relate to places and traditional structures that he encountered on his subsequent trip to Morocco. However, judging from these works, Twombly’s research uncovered a dark strain in the continuities between ancient and modern. Symmetrical order surges with elemental emotion or danger. Dualities are evoked in the stark contrasts of palette, the prickly erectile forms, and the worn surfaces, but we are left with uncertain conclusions about the dialectic between good and evil, life and death, the beastly and the human. 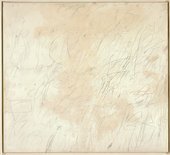 The works, along with Twombly’s intention to find ‘roots,’ should be interpreted in relation to a question that nagged at Americans during this era. Why had human beings failed to resist the events and systems that had produced worldwide calamity? A sense of moral bankruptcy, anxiety, and confounding dichotomies penetrated post-war American life despite new material well-being. This search for a unifying essence or source of humanity was complicated by a countervailing turn from collectivity toward the self, a turn notably present in the Abstract Expressionists’ emphasis on subjectivity. A dense body of scholarship has revealed that the Abstract Expressionists’ understanding of subjectivity paralleled that of left-wing intelligentsia of the time.8 Frankfurt School social theorists, Jean-Paul Sartre, C. Wright Mills, and Dwight Macdonald all contributed to the mix of Marxist, Existentialist, and American Pragmatist theory known to the Abstract Expressionists. In general, these artists and intellectuals, acknowledging the failure of collective bodies (particularly the working class) to avoid totalitarianism, argued that human freedom was threatened by over-determined, instrumentally-rationalised forces embedded within social structures. Their targets included both capitalist and Marxist economic systems, unfettered mass media, and blind trust in the science industry. To oppose collective forces, the left wing placed the responsibility of moral agency on the individual. Ultimately, subjectivity was constructed as the power to wield non-rational, intuitive, and emotional knowledge against tyrannical reason and mass culture, thereby asserting freedom. According to this formula, artists had a special role. They were conceived both as having more penetrating access to the non-rational forms of knowledge and experience, especially the imagination, and as being alienated from entrenched power structures, hence, less susceptible to mass mentality. In theory, artists had an increased ability to expose the corrupted world order and potentially to conceive alternative ones. Privileging the artist’s subjectivity served to move critique and protest to the aesthetic sphere, away from the socio-political realm. Twombly would have been well exposed to this discourse. Among artists, Robert Motherwell, who would become one of Twombly’s mentors, actively argued for subjective expression of humanist values and for the artist as author of critique. In 1948, he wrote of modern art becoming a ‘peculiarly modern humanism’ through which ‘humane men [defend] their values … against the property-loving world.’9 In 1950 he declared that art, ‘might be summarised under the general notion of protest,’ ‘a kind of dumb, obstinate rebellion at how the world is presently organised.’10 Motherwell assiduously developed this polemic, in prolific writings and in paint, notably in his long series, stretching from 1948 to 1991, ­­­­­­­­Elegy to the Spanish Republic. Twombly’s early production should be viewed as inscribed within this humanist project oriented toward the assertion of subjectivity and freedom in an increasingly alienating and homogenising world. Twombly’s works are imbued with the anxieties, priorities, and theories of the immediate post-war era. The uncertainty of the period is communicated in the muddied contrasts, the repeated, injured forms, the fevered brushwork, and the crumbling, crude geometries and patterns. They raise intransigent questions relevant to the time. Does the so-called ‘primitive’ mind have more emotional, intuitive depth and humanity than the reasoned, controlled, modern one? Are enlightenment and myth the same? Is timelessness an illusion of circularity, recurrence, replication? Can the universal be revealed through a subjective and particular vision? Twombly’s early works owe a great deal to the Abstract Expressionist paradigm, explicit as they are in their themes and subjective perspective. However, they also appear less dramatic and situational than the offerings of Pollock or de Kooning whom Twombly admired. In fact, by 1955, a significant change had occurred. Paintings, such as The Geeks (fig.5), Free-Wheeler, Criticism (fig.6), and Academy (fig.7) are inarticulate and unsettled. Though the surfaces are energised, the movement is frenetic and spasmodic. Between 1951 and 1955 Twombly constantly moved from place to place: up and down the East Coast, to Europe and North Africa. Then, for less than a year, in 1953 and 1954, his freedom was constrained by Army service and his assigned duty as a cryptographer. It was during this time that Twombly made what he considers to be breakthrough drawings, brought to fruition in New York in the 1955 paintings. The pinched, compulsive quality of these works may channel the frustration and uncertainty of vaulting from life as an artist to that of disciplined conscript. However, they also describe the stifling times and the paranoiac atmosphere of Cold War America. The fact that protest had been moved to the arts was branded as either quiescence and co-optation or a dissent so coded that it was unintelligible to the masses. This silencing had been enacted at Black Mountain College in North Carolina where critique literally moved out of the socio-political world and onto a southern-style Parnassus. By the time that Twombly and Robert Rauschenberg attended sessions in 1951 and 1952, Black Mountain had become a refuge for disenfranchised New Deal leftists, like Ben Shahn and Aaron Siskind; an array of Abstract Expressionists, including Motherwell and Franz Kline; and the poet-essayist, Charles Olson, rector of the College, whose political troubles were such that the FBI visited in the summer of 1952. These older leftists fashioned a laboratory for the next avant-garde generation, attracting Rauschenberg and John Cage, who would remain in Twombly’s circle. Olson, more chaos-inducing impresario than dignified tutor, encouraged what could be described fairly as a convention-flouting community of academics, geeks, and free-wheelers whose fate and foibles may well be insinuated in these paintings. These canvases have been read as an upstart’s response to the authorial dictums and muscular style of Jackson Pollock. Certainly, Twombly does take on the reigning avant-garde. He reduces their confident sweeps of paint to pencilled scribbles and erasures; he subverts their solemn renderings of the tragic or sublime with satiric outbursts of the ‘f’ word. The paintings are impure and taunting. Expletives, intelligible or not, mark and mar the canvases signalling a start to Twombly’s long disquisition on the paradoxical relationship of word and image and of writing and drawing. And, in doing so, Twombly reveals himself to be an artist rude enough to ignore the etiquette that separates them. He sullies and confuses both the sacral field of paint and the metered, formed domain of words. If the titles were arbitrarily chosen as is claimed, then the results were fortuitous in the extreme. More likely, Twombly treats us to some of his cryptographer’s obfuscation. The word-and-picture-play is laden with possible ironic reference to his own life’s circumstances, and to mentors, allies, and critics. Canny, subversive tactics abound. The randomness and disrespect that infect Twombly’s 1955 canvases display a shifting sensibility. Apparently, Twombly does not aspire to use his subjectivity for mastery. There is no interest in taming and controlling his media nor in presenting anything like a unified vision. The heroic power, sensuality, and fluidity of the Abstract Expressionists has dissipated into stuttering, indeterminate parries. The existential struggle against contingency is replaced by acceptance, if not an embrace, of chance, ambiguity, and chaos. The unavoidable implication is that the theoretical apparatus of his predecessors requires adjustment. These works illustrate Twombly’s engagement with many of the ideas and practices circulating at Black Mountain. The College was founded on the educational precepts of the American pragmatist, John Dewey, who rejected foundational knowledge and subject/object dualism in favour of contingent, relative knowledge emerging from humans actively interacting with and adapting to the material facts of the environment. Not averse to science or its methodologies, Dewey’s naturalistic approach emphasised experiment in which knowledge accrues and evolves from the trial-and-error process of inquiry itself. In two controversial essays, ‘Projective Verse’ of 1950,14 and ‘Human Universe’ of 1951,15 he began to plot ‘another humanism.’16 His approach was an unprogrammatic, deeply personal incorporation of Ezra Pound’s poetics, twentieth-century theories of intersubjectivity and phenomenology, and Alfred North Whitehead’s philosophy of process and organism. 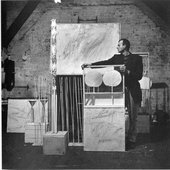 Olson subverted both collective and subjective identity; proposed immaterial process to be reality; advocated organic, open form; and required participatory interpretation – all positions associated with Twombly’s generation and with post-modernism. Although Olson was probably the first in the United States to refer to ‘postmodern’ society, his project outlines an alternative model of humanism – a most useful one through which to read Twombly’s works of the mid to late 1950s. For Olson, the activity – the process – of forming was a uniquely human mode of intelligence and the source of agency. According to Olson, ‘an idea means to see … Action is to move toward form. To act, then, is to go from to see to to do (to finish is to do, & so to make a poem, or anything’21 – presumably ‘anything’ like Twombly’s Blue Room or Olympia (fig.8) of 1957. These paintings figure instances of apprehension – cascades of spontaneous, incomplete perceptions – sharing a field with more fully developed images moving toward form. Olson used the body as a measure. He regarded each utterance to be an evocation of a moment’s energy, a physical exhalation of sorts, discharged without pausing to find the mot juste or, in Twombly’s case, the elegant line. 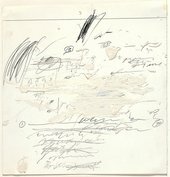 Everything is put into motion, relationships occur, energies are transferred, and forms emerge naturally from content.22 Twombly’s haphazard, half-written words and poorly-determined strokes create a form uniquely his own, a hybrid of painting and poetry emanating from bodily surges of expression. Moreover, growing out of the context of Italy, the energy of these paintings seems euphoric and free-spirited compared to the taut productions made in America. For example, Arcadia (fig.9), of 1958, vibrates with ‘kinetic’ events and with Twombly’s ‘choices’ to merge his energy with ephemeral whiteness and Poussin’s legacy. The series, Poems to the Sea (figs.10, 11), of 1959, makes manifest Olson’s demand that humans must find their proper relation to nature and look to it for the principles of formation that ceaselessly advance from it. In 1957 Twombly described a ‘synthesis of feeling, intellect etc. occurring without separation in the impulse of action.’23 As Olson would have liked, each image is a site of activity – of sensate energies transformed to intellection, then action. As a group, we see serial experimentation and a succession of phenomenological states. An open architecture of knowledge emerges – instinctual, emotional, abstract, logical – all formed from nature organically, if not always coherently or smoothly. Twombly uses a similar approach in The Age of Alexander. He vacillates between heroic and personal history, grabbing and layering bits and pieces of time and space. Events of the past, Alexander’s campaigns, exist on the same plane of reality as Twombly’s present and the infant Allessandro’s future. Twombly’s journey into the moment is felt in intimate, immediate terms and in global proportion. It is fragmentary and incidental, residing on the canvas and across continents. Twombly located the poetics. As the calendar turned from one decade to the next, Twombly was moved to engage in the phenomenal reality that enveloped him in that particular place and time in Rome. The Age of Alexander has the aura of something deeply felt and private. At the same time, it communicates realities common to all human beings. In league with Alexander and Allessandro, Twombly brought forth the conditions we all recognise in human passage – birth and death, triumph and calamity, hubris and humility, the memorable and the forgotten, the epic myth and the cautionary history. In Twombly’s hands the lessons of the new humanism were twofold. First, history and myth are chronicles of human action and making. If there are any absolutes or universals that form a core of human commonality, it is the sheer process, the compelling action, which moves us toward some meaningful end. Second, it is the finding of the meaning that is singular, particular, and transcendent. In this endeavour, we have Twombly ‘making’ history, formed not as a succession of events, but as sets of interpenetrating, active, indeterminate relationships. As the 1960s arrived, Twombly would step into the rich traditions of Italy and add new layers and critiques to his consideration of humanism. However, his commitment to humanistic study grew out of his own penetration of American culture at mid-century. 1. Heiner Bastian, Cy Twombly: Catalogue Raisonné of the Paintings, Volume 1: 1948–1960, Munich 1992, p.211. 2. Peter Schjeldahl, ‘Cy was Here; Size Down’, Artforum International, vol.33, no.1, September 1994, pp.73–4. 3. Rosalind Krauss, ‘Cy was Here; Cy’s Up’, Artforum International, vol.33, no.1, September 1994, p.118. 5. Kate Soper, Humanism and Anti-Humanism, La Salle, IL 1986, pp.11–12, 18. 6. Kirk Varnedoe, Cy Twombly: A Retrospective, New York 1994, p.56, fn.48. 7. The term, ‘myth maker’, was used by the artists themselves. See Mark Rothko, Clyfford Still, New York 1946. See also, Ann Gibson, ‘Editor’s Statement’, Art Journal, vol.47, no.3, ‘New Myths for Old: Redefining Abstract Expressionism’, Autumn 1988, pp.171–3. 8. Key texts include: Daniel Belgrad, The Culture of Spontaneity: Improvisation and the Arts in Postwar America, Chicago 1998; Ann Eden Gibson, Theory Undeclared: Avant-Garde Magazines as a Guide to Abstract Expressionist Images and Ideas, Ph. D. diss., University of Delaware, 1984; Nancy Jachec, The Philosophy and Politics of Abstract Expressionism 1940–1960, Cambridge 2000; Michael Leja, Reframing Abstract Expressionism: Subjectivity and Painting in the 1940s, New Haven and London 1993. 9. Robert Motherwell, ‘A Tour of the Sublime’, 15 December 1948, in Robert Motherwell, The Collected Writings of Robert Motherwell, ed. Stephanie Terenzio, Berkeley, Los Angeles, London 1992, p.53. 12. Ann Fulton, Apostles of Sartre: Existentialism in America, 1945-1963, Evanston IL 1999. 13. Charles Olson, ‘Human Universe’, in Collected Prose/Charles Olson, ed. Donald Allen and Benjamin Friedlander, intro. Robert Creeley, Berkeley and Los Angeles 1997, pp.158–9. 14. Charles Olson, ‘Projective Verse’, in Collected Prose/Charles Olson, pp.239–49. 15. Charles Olson, ‘Human Universe’, pp.162–3. 16. Charles Olson, ‘Mayan Letters’, in Selected Writings, ed. Robert Creeley, New York, 1966, p.93. 17. Robert von Hallberg, ‘Olson, Whitehead, and the Objectivists’, boundary 2, vol.2, no.1/2, ‘Charles Olson: Essays, Reminiscences, Reviews’, Autumn 1973–Winter 1974, pp.85–112. 18. Charles Olson, ‘Cy Twombly’, in Nicola Del Roscio ed., Writings on Cy Twombly, Munich 2002, p.11. 19. Alfred North Whitehead, Adventures of Ideas, New York 1933, p.120, in von Hallberg, p.92. 20. Charles Olson, ‘ABCs (2)’, in The Collected Poems of Charles Olson, ed. George F. Butterick, Berkeley and Los Angeles 1997, p.173. 21. Charles Olson, ‘Rime’, unpublished, in von Hallberg, p.92. 22. Olson, ‘Projective Verse’, p.240. 25. Von Hallberg, p.93 and Clark, pp.220–1. 26. Charles Olson, The Special View of History, ed. Ann Charters, Berkeley, 1970, pp.19-20. Written in 1956. See also, Margaret Jan Bender, Cinvat Bridge Maximus IV, V, VI and Charles Olson’s Special View of History,’Ph.D. diss., Columbia University, 1997. 28. Charles Olson, ‘Cy Twombly’, in Del Roscio, p.11. 31. Charles Olson, ‘A Later Note on Letter # 15,’ in The Maximus Poems, ed. George F. Butterick, Berkeley, Los Angeles, London 1984, p.249. The poem is dated 1962. This paper was delivered at the conference Cy Twombly: New Perspectives, held at Tate Modern, 19 June 2008, to mark the exhibition Cy Twombly: Cycles and Seasons. Carol A. Nigro is completing her doctoral degree at the University of Delaware. Carol A. Nigro, ‘Cy Twombly’s Humanist Upbringing’, in Tate Papers, no.10, Autumn 2008, https://www.tate.org.uk/research/publications/tate-papers/10/cy-twombly-humanist-upbringing, accessed 18 April 2019.